MPHDA Plaques are suitable for placement on “contributing” properties within the Montrose Park Historic District. They are available to members of MPHDA for $200 and non-members for $240. The latter includes a $40 “Supporter” Membership for the current calendar year. A contributing property is defined as: any buildings, structures, sites, or objects that are integral components of the historic district either because they date from a time period for which the district is significant, or because they represent an architectural type, period, or method for which the defined historic district is significant. All properties within the historic district have been determined to be “contributing” or “non-contributing” properties. Check the Homes section to find out whether your property is a contributing property. 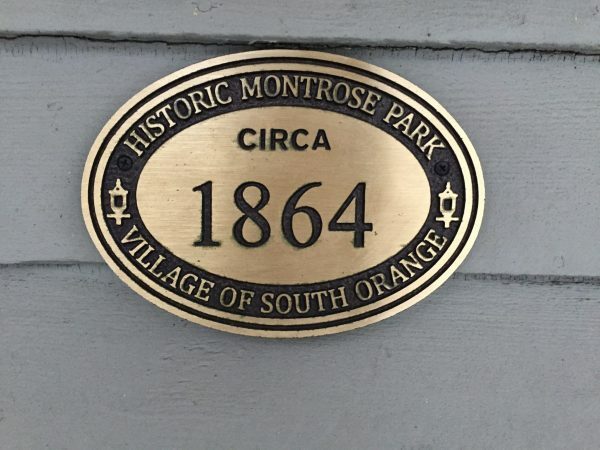 Text: “HISTORIC MONTROSE PARK” “VILLAGE OF SOUTH ORANGE”. Date: The “built” or “circa” date of the home is engraved on the plaque after casting and appears within the center brushed bronze portion of the plaque. Homeowners are responsible for researching the “date built” or “circa date” which is to be engraved on the plaque. The date of your home can be determined via title searches, Village Hall Records, and/or tax maps, deeds or other records stored at the Newark Hall of Records. For further information on how to complete this research, call the New Jersey Department of Environmental Protection’s Historic Preservation Office in Trenton, NJ (609-984-0176). Download the order form or simply fill in the information below.